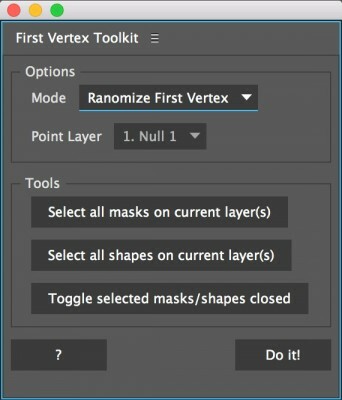 First Vertex Toolkit allows you to easily manipulate the first vertex of any mask or path, which is very useful for stroke on effects and many other effects. It has three different modes that allow you to have complete control over the direction and starting point of your stroke on effects! Random mode allows you to randomize the starting point of your masks or paths. Reverse mode allows you to reverse the direction your mask or path is drawn on. Closest to Point mode allows you to set the starting point of your mask or path to the vertex closest to a given point.